I began fishing in England when I was about 6 years old. After immigrating to Canada I spent the majority of my youth on Southern Vancouver Island. I hooked my first trout on the fly on the Skagit River near Hope. I was hooked! That was over 15 years ago. 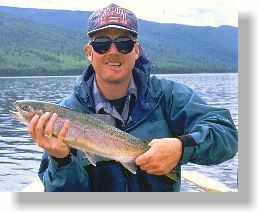 Since that time I have had the pleasure of providing numerous seminars and courses on all manner of fly-fishing and fly tying throughout the Pacific Northwest. I participate regularly in the International Sportsman's Expositions in Seattle and San Mateo plus local shows within the greater Vancouver area. As a commercial fly tyer I have been fortunate to include such customers as Brian Chan, Gordon Honey and some of the members of Canada's 1994 world fly fishing team that traveled to Norway. I am currently a contract tyer with Umpqua Feather Merchants. In 1994 I began my own proprietorship, Fly Craft Angling Adventures. I am thankful to such magazines as B.C. Outdoors, Fly Tyer, American Angler, Fly Fisherman, Fly Tying and Fishing Journal and Fly Fishing for publishing my work. I am past president of the Osprey Fly Fishers of B.C. and a former director with the B.C. Federation of Fly Fishers. Organizations such as these perform work that all fishermen can benefit from. With each fishing trip, class, or seminar I always end up learning something new and enjoy meeting new people along the way. In Fall of 2000 I was pleased to announce the release of my first book, Fly Patterns for Stillwaters. My initial concept for this book began in 1995. After some thoughtful prodding, counseling and encouragement from my wife and friends I decided to put my idea into motion. 5 years later, the book was completed and I must say that I am very pleased with the outcome. My hope is that you will agree and that Fly Patterns for Stillwaters will be a long-standing stillwater fly pattern reference book for many years to come. Drop me an e-mail at flycraft@shaw.ca. I always like to here of someones good fishing or fly patterns.